But hardly anybody uses the cockpit view! That's what Codemasters had to say, anyway, about the discontinuation of the cockpit view in its latest racer, GRID 2. Try telling that to PC gamers, though. Following GRID 2's release last week, modders have been working to build their own cockpit view—here's what they've come up with so far. Modders have been congregating at the Race Department forums , where all manner of mods and additions have already begun to go up. Our first look at a GRID 2 cockpit view came courtesy of forum user Svartyr, who put together the blurry-but-serviceable view above. That's been followed up by HoiHman, who did some further work on the car's interior before posting the below scheenshot. It's a lot less blurred this time around, but he thinks a dedicated texture artist may still be needed to get things looking 100%. This is one of the best things about PC gaming: Don't like it? Chances are, you can fix it yourself. 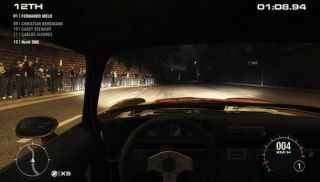 Codemasters revealed that only 5% of gamers used cockpit view in the original GRID, so you can understand the feature's removal in the sequel—though it's awesome that the minority can tweak a game to include obscure features, too. Cockpit view isn't the only modded-in feature in progress; Race Department's got fixes on the way for all sorts of things, including less tire smoke and the inclusion of an array of hotrods.